English chemist, was born in 1837. He was one of the first, if not quite the first, to propound the conception of periodicity among the chemical elements. His earliest contribution to the question took the form of a letter published in the Chemical News in February 1863. In the succeeding year he showed, in the same journal, that if the elements be arranged in the order of their atomic weights, those having consecutive numbers frequently either belong to the same group or occupy similar positions in different groups, and he pointed out that each eighth element starting from a given one is in this arrangement a kind of repetition of the first, like the eighth note of an octave in music. The Law of Octaves thus enunciated was at first ignored or treated with ridicule as a fantastic notion unworthy of serious consideration, but the idea, subsequently elaborated by Dmitri Mendeleev and other workers into the Periodic Law, has taken its place as one of the most important generalizations in modern chemical theory. Newlands, who was of Italian extraction on his mothers side, and fought as a volunteer in the cause of Italian freedom under Giuseppe Garibaldi in 1860, died in London on the 29th of July 1898. 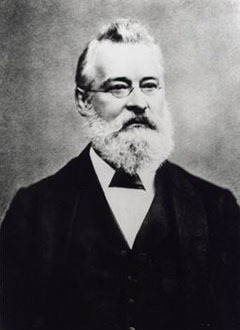 He collected his various papers on the atomicity of the elements in a little volume on the Discovery of the Periodic Law published in London in 1884.